and social riders. Designed with the special "Rapid T-Valve" it switches between Presta & Schrader valves with ease. The connection fits perfectly, avoiding annoying leaks. 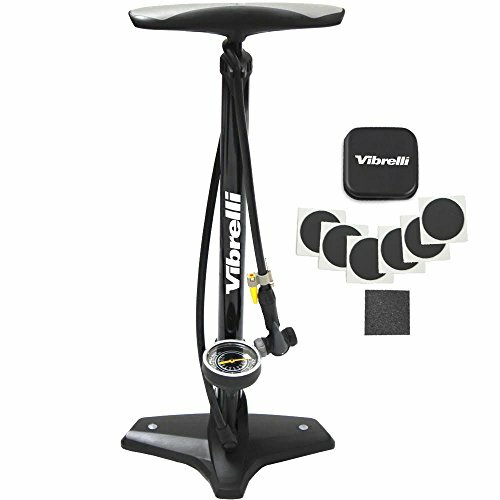 our floor pump inflates to high pressure of 160 PSI, a high performance road bike pump for all riders. The longer barrel allows for larger volume of air to be pumped with each stroke, resulting in faster inflation. There's nothing more annoying than a bike pump with a gauge that's faulty. We've all had an unfortunate flat at the worst possible time. We include our glueless puncture kit with your floor pump. rough the surface with the sandpaper provided, apply a patch and inflate. Includes: Glueless Emergency Puncture Kit so you'll never have to worry about being left stranded, also ball inflation needle and inflatable device valve. Built to Last: Comes with 5-year Manufacturer's Warranty, you can buy this Floor Pump with confidence! If you have any questions about this product by Vibrelli, contact us by completing and submitting the form below. If you are looking for a specif part number, please include it with your message.